It is hoped that visitors to this website will enjoy the accounts of the Challenge Walks and other walks in the Peak District, The Yorkshire Dales, Wales (including Snowdonia) and the various Cancer Research Sponsored Walks that have been documented. Mary Dormer Harris Memorial Bursary. This website is a loose record, with photos, of some of the walks that I have made accompanied by either friends (the "Boys") or family. They include taking part in a number of Challenge Walks, climbing a few mountains and numerous visits to the Peak District and other walkable areas in and around the Midlands. Oh yes, and various hostelries that have been visited on these excursions. 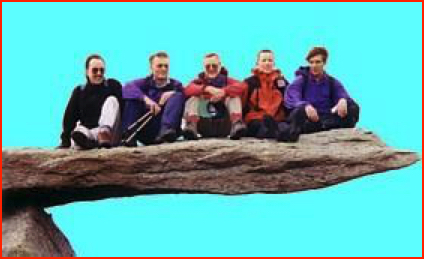 The Cantilever Rock, on top of the Glyders in Snowdonia. Left to right are Larry, Barry, Mick, Greg and Mark, one of Greg's friends.